Thread: Happy Holidays from the Nosgoth Team! Whether favour the Vampire or Human side of this war between species, everyone here working on Nosgoth would like to wish you all a joyous, safe & wonderful Holiday period. We hope you all have a fantastic time, maybe even to come across some of you in-game (I'll certainly be stalking Nosgoth's battlefields - Oghamsmith). 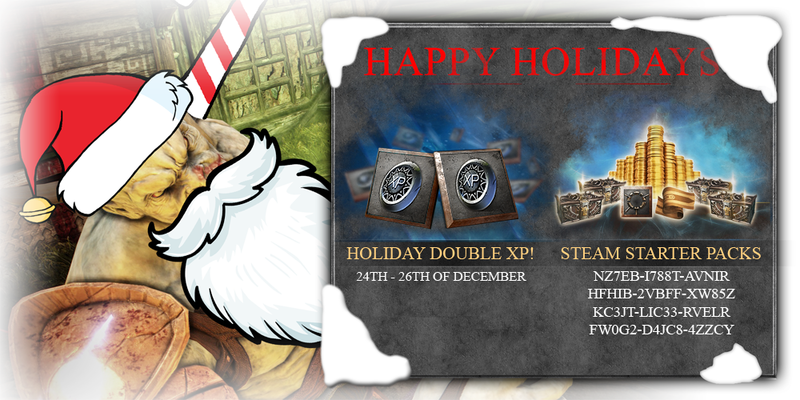 To celebrate this time of year, we're running a double XP event, and also giving away some starter packs. You'll need to be quick to grab these keys, though as we're sending them out on a first come - first served basis! If you didn't managed to get any of the above, don't worry, we'll be giving more keys away on www.Twitter.com/Nosgoth throughout the day. Make sure to keep an eye out over there if you're eager to get a pack. 1-Where I put the code to get the starter pack? lol, tried about 8 combinations of latest keys after 30 mins they were post on twit. Failed everysingle one and got "banned" for to much tries on steam. So I posted this october 2014. I still want my Tyrant in a santa hat though! At last, my dream was accomplished in that image! I take full credit for that.